Why are you wasting time looking at this page? why don't you visit the Advantage Tennis pages and see my Tennis photos, or look at the Tennis Links I maintain. Still here? then let me introduce myself - I'm Michael McCarron, usually I'm called Mick, but somewhere along the line, some people started calling me Mike. So if you call me Mike and I ignore you, then please do not be offended, I just don't think you are talking to me! Have you noticed that you can always find out what males are called by their mothers, put them on a tennis court and they always mutter, "come on ..........", in my case it's Michael. What I do nowadays is some Tennis Coaching, Fitness training and photography, a lot of Tennis Photography and and some Running and Cycling Photography. In January 2011 I went Skiing in Serre Chevalier, definitely would go there again! A couple of videos of me skiing are on this page. For Christmas 2011, I Skied Val D'Isere France, to make my personal GPS system useful, I have created a set of Waypoints marking the top and bottom of each lift and a path for the lift. The map with the waypoints and paths is on this page. and Back again for Christmas 2012 trying out the Nike+ sports watch for skiing. There are a number of McCarrons around the world who are tracing the McCarron family tree, to assist these people, I hosted the Family tree on this site, but due to the torrents of spam it generated I had to remove it! Most homepages have a photo of the author, so here it is! I accidentally tripped the shutter, picking up the camera when it was on the floor of the car! My hometown is Hove, Sussex England, where? you may ask, its merged with Brighton to become the City of Brighton and Hove, it's on the South Coast of England, about 50 miles south of London. Virtual Brighton is a good set of pages to find out about my home town. 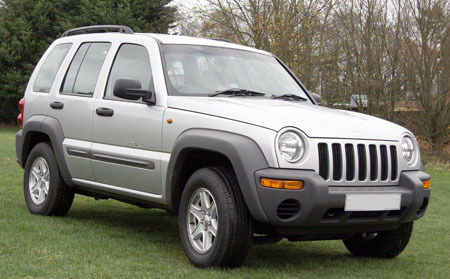 The current car is Chrysler Jeep Cherokee (KJ), in America it is known as a Liberty. Chrysler should have called it a Liberty in the UK as they took a Liberty when they converted it to Right Hand Drive. The gearstick is in the wrong place for a RHD vehicle, it is angled towards the passenger seat! The Handbrake is on the passengers side of the transmission tunnel, you have to lean over to operate it! The Four wheel drive gear stick is on the passengers side almost out of reach of the driver! The bonnet release catch is in the front passengers footwell, not a good idea to have the bonnet opened at 60 mile per hour! The engine is a 2.4 Litre engine, Lamborghini co-operated in the engine development, I always wanted a Lamborghini and now I have a bit of one, trouble is Lamborghini make trucks and this engine has such a flat response like a Diesel engine I had to open the bonnet to check it was a petrol engine. The 2.4 Litre Jeep Cherokee is totally underpowered! I think they just slapped the engine into engine compartment and grafted it onto the gearbox out of the 3.7 Litre version, 4th Gear is a high ratio and fifth can only be engaged when running downhill with the wind behind you. Chrysler, how did you manage to ruin such a great Vehicle? 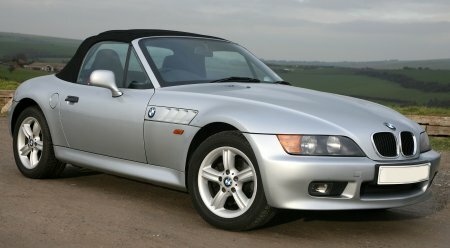 The other car is a BMW Z3. The Fronteria 2.4I is no longer with me, it was killed off by a Vauxhall main agent. I contacted my local Vauxhall main dealer as the engine started to overheat and I did not have the time to sort it out myself, a big mistake! I spoke to the main agent and they said it was probably the cooling Fans. I should have walked away then as the 2.4 Fronty does not have cooling Fans! I took the Fronty to them with a letter describing the problem and suggested that the Water Pump was failing. A couple of hours later had a call from the receptionist who said there was nothing wrong with the vehicle. I told them they needed to think again, and she handed me over to the mechanic who just happened to be standing next to her. Had a long discussion about the problem and why I thought it was the Water Pump. He thought it may be the Viscous Coupling, we had a discussion on how it would be tested. Rings back later and said it was the Viscous Coupling, they changed it, charged me for both investigations and the parts. Picked up the vehicle, although there was an improvement it did not solve the problem. Two days later on the motorway the engine overheated big time, by the time I had stopped, the engine had dumped all the engine coolant out for the Water Pump bearing. A long wait at the roadside to get a tow truck big enough to tow me home. I stripped down the vehicle to get at the water pump and confirmed that the pump had failed. I changed the pump and everything was OK. 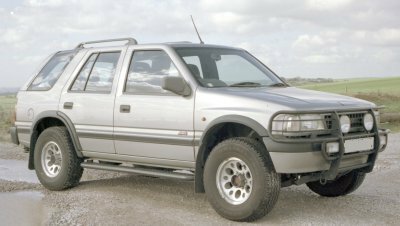 But the long term damage had been done, when you overheat an engine the head gasket is compressed, when it cools it allows over a period of time coolant to creep across the head surface until it fails. It failed, but it was not worthwhile repairing. Some advice, when dealing with a main agent don't assume they know what they are talking about. When an engine overheats pull the head down. Going through some old photos and found one of the TR7. The model had a lot of bad press but I had none of the problems. Six months after I sold it, it burnt out! Over the years I have had a variety of Cameras, the favourite was the Olympus OM1N, which was my first decent SLR with good lenses. I purchased a Tamron 300mm F2.8 which fitted the OM1N with an adapter, this lens showed up the limitations of the OM1N, only 1/1000 sec max shutter speed and manual focus. It was possible to get very good shots with this camera and lens, but I also missed a lot. I sold all my Olympus equipment and purchased a pair of Canon EOS 50e's to use with the Tamron 300mm F2.8 which fitted the Canon body with a very rare adapter. I kept these cameras for a year and then upgraded as they became a bit distressed being made of plastic. One was totally destroyed as it bounced down a flight of concrete steps, have you ever seen your camera shed pieces every time it bounced? not a pretty sight! The following is a list of camera equipment I have owned and some insight to why and any opinion I have on the equipment. The 50e's were replaced with an EOS 1N which was great except for the flash control. I sold the EOS 1N and purchased the EOS 1V complete with two NiMH battery packs. 9-10 frames a second with matrix metering! For Tennis photos, I use centre point focus with Custom function 17 set to 2. On a 300mm F2.8 lens the AI focus stays in lock nearly all of the time. The digital revolution has taken over, I have sold all my 35mm Film Cameras. Canon EOS 3 I needed a second Camera for a backup to the EOS1N which also worked well with a flashgun, the EOS 3 fitted with the Power Booster PB-E2 is as good as the EOS1N and has has better exposure control with the matrix metering and is far superior at controlling a Flashgun. I normally leave this camera on the Canon 70-200mm lens. A good camera, but since buying a decent digital camera, the EOS 3 sits in it's box at home, so I have sold it. Canon 10D I had purchased a Canon D30 when they were first announced and when the D60 was announced I put a deposit on the D60 and had one of the first delivered in the UK. The image quality of the D60 is very good and most of the problems with shutter lag and writing delays to the compact flash card D30 have been fixed. It still has a problem with staying in focus lock when held vertical, this is due to the AF sensors. Canon lent me a 1D and a 1Ds for a few days, the 1D is great, but I did want to reduce the image size to 4 Mpixels and the 1Ds is very expensive. I decided to sell the D60 and purchase a 10D, I expected that Canon would introduce an updated 1D with 5-6 frames a second and 8 Mega pixels, I can wait until one of these become available. The image quality of the 10D has low noise even at high ASA settings therefore I have changed the type of film I use in the EOS1V and EOS 3, I now use Fuji Reala which is 100 ASA, if I need higher speed, I use the 10D. What I don't like about the D30,D60 10D is the size of viewing screen, it is smaller than the EOS 1N and EOS 3. Since purchasing the 1D Mark 11 and the EOS 5D, the 10D is now kept as a backup. I did consider selling the camera but the price is so low it is better to keep as a backup. If you want a cheap very good digital camera keep an eye out for a used 10D. I have now sold the 10D, someone had a bargain! Canon 1D mkII not a bad guess that it would be 8 Mega pixels, the 8 frames a second surprised me. Canon had an offer on the 1D which was so attractive that I ordered one. The offer was so good that worldwide stock disappeared before mine was delivered, so I converted the order into a pre-order for the 1D mk11 and received one of the first in the UK. Good sized viewer, very fast autofocus and decent images, almost as good as using the 1V. Purchased a second 1D mkII to use as backup and on the 200mm F2.8 lens, sold the second body to buy the 7D. Canon 5D Sometimes I need to change lens quickly and all the settings on the 1D mk11 to take flash photos etc. I decide to purchase a 5D and use it as the second camera. Use this for portraits and presentations. Canon IX this is the Canon designed as the top of the range APS camera and included all of its exposure technology. A great little camera, shame it is as big as a 35mm camera when fitted with the 1.8 lens. Sold the IX as it was sitting in the cupboard. Pentax 645N an overgrown SLR which has an image size of over three times a 35mm camera. Produces great images and allows you to use that funny stuff called roll film! I purchased camera as there is a 300mm F4 lens available which enables me to produce some stunning images. Sold the Camera as it was not being used, the 5D produces images that are almost as good! Fujifilm FinePix V10 a 5.1 Mega pixel camera, nice and compact fits in the shirt pocket. Shame about the image quality, a lot of noise. The AVI video clips produced are good, with a 1GByte card in the camera, which gives 15 minutes of video and the large viewing screen, who needs a video recorder? Lent it to a friend to take on holiday, he left it in a Bar in Italy! Fujifilm Finepix F60 this was purchased as a replacement for the V10, stays in the glove box of the car. Canon 50D purchased this for its write speed to a UDMA Compact flash card, this camera has become my first choice for shooting runners. Canon 7D purchased this for it's sensitive off centre focus points, should end up being the first choice body for runners. Casio F1 - 6 Megapixel images at 60 frames a second and 300 frames a second Video! Canon 50mm F1.8 MKII this is the standard lens for 35mm, it is very sharp and focuses quickly and quietly. The body of the lens is constructed from plastic which gives it a cheap feel, a lot of people like the MKI lens as it is constructed from metal, but as the MKII lens is so cheap I can live the plastic and replace it new if it ever gets damaged. If you own a Canon EOS camera you must have this lens. Canon 24-85mm F 1:3.5 -4.5 a well built lens, small and lightweight, good as a general purpose lens. I usually keep this lens on the 10D. Sigma 28-70mm F2.8 EX This lens is for general use, it's sharp and the auto focus is relatively fast, even though it is does not have the HSM motor. Fitted onto the D30, D60 or the EOS IX the lens hood obstructs the light path of the built in flash. Canon 70-200mm F2.8 Before purchasing this lens I used the Sigma the Sigma 70-200, the Sigma 70-200 drops out of focus lock when used on the D30, I took this as the norm until I swapped lens with an other photographer who wanted to use the 300mm F2.8, the Canon 70-200 stayed in lock most of the time, that was it, I purchased the 70-200mm. I did have the choice of buying the IS version but chose the non IS version because I do not seem to need the low shutter speeds when the IS version would help. Canon 70-200mm F4, tried this lens for a while, did not work well on cameras that enabled focus points depending on the lens attached. Sold it fairly quickly. Might have been a mistake to sell it as it should work well on a 7D! Canon 200mm F2.8L USM II What can you say about this lens? Well done Canon, it's a great lens! Optical quality is superb, it's light and the autofocus is fast and silent. The old guideline still applies, a prime lens will always be better that a Zoom, the optical quality of this lens is better than the Canon 70-200 and the Sigma 70-200 at the 200mm end. I like using this lens with the D30,D60 and 10D. Canon 300mm F2.8 the Tamron is a great piece of glass but I ended up with a number of photos that were marginally out of focus so it had to go. The Canon 300mm F2.8 was purchased as a replacement, the non IS version was chosen because for the type of photos I take the IS function does not help, every time I have used an IS lens I have turned off the IS. Pentax 75mm F2.8 the standard size lens for a 645 format camera, sharp images. Pentax 150mm F2.8 Portrait Lens. Pentax 300mm F4 great images and a low bank balance! Flashguns after using several flashguns I decided to buy the top of the range of Canon flashgun, the Canon 540EZ, with this gun I use the Stofen diffuser which helps to eliminate the hard shadow from a head and shoulders shot. The Flashgun has plenty of power, which is well controlled by the Canon EOS 50E body, the metering system works of the 50E works really well with the 540EZ. When using the diffuser, the amount of charge used per shot is higher than without the diffuser, this places a demand upon the battery to recharge the Flash quickly, for reliability I use the Quantum QB1 Battery pack and charger. When the D30 was purchased I discovered that it did not work with the 540EZ, so I purchased the 550EZ which works well with the D30, D60 and the EOS 3. Thomson VMD20 video camera, uses MiniDV tape cassettes. Has a X2 record mode, great for Video Analysis of Sport. Firewire connection to a PC. Canon FS100 video camera that records at 16:9 format to an SD card, also shoots stills. Casio F1 - gets a mention again as a 300FPS super slow motion Video Capture. Fujifilm Finepix F60 gets a mention again because it can shoot Video. Website The photos on my site, www.advantage-tennis.com have been scanned using several methods. Microtek ScanMaker 35t Plus The Microtek ScanMaker 35t Plus is a 30bit 35mm negative scanner which has a SCSI bus interface, I have used this scanner on a Apple Mac and now use it on a PC. It is simple to use, and has a reasonable quality scan that is suitable for scanning photos on the Net, it is not very good for scanning photos to be printed as most 36 bit negative scanners are far better. Epson GT-9600 The Epson GT-9600 (marketed in the States as the Expression 800) is an A4 flatbed 36bit scanner The resolution of the scanner is 800x3200 bits, this is a great scanner for scanning photographic prints and fitted with the transparency media adapter it can scan negatives or positives, the quality is acceptable for publishing on the Web but is not really good enough for high quality prints. What I use the transparency media adapter for, is to scan my negative files to produce a positive image. I store my negatives in a clear plastic file sheets, this scanner can scan through the plastic file sheet and produce a reasonable image to act as a reference. A sample of the scanned image is on this page, the negatives are in the plastic file sheet whilst they are being scanned, the quality is better than expected! A comparison between scans from the Epson, Microtek and a Kodak photo CD scan, can be seen on this page. Minolta Scan-Speed. The Microtek is a 10bit scanner which gives 1024 steps from the blackest black to the whitest white, on photos that have a wide range detail is missed out which tends to ruin the best photos. The Scan-Speed is a 12 bit scanner which gives it 4096 steps enabling it to capture a lot of detail. The software supplied from Minolta is cr*p! I use Viewscan. Minolta Dimage Scan Elite 5400 with a 16bit A/D convertor and 5400 dpi this gives great images. The software is good, but I still use Vuescan. Epson 3200 flatbed, I had purchased this scanner as a means of getting digital images from the Medium Format negatives. The quality is acceptable to make a print from the digital image, but you don't get the stunning quality associated with Medium Format. What was a surprise with this scanner was the ability to scan 12 35mm negatives with one click! The image quality is ok for small size images to publish on the web.